update your pearls/beads into another design (eg add other beads/gemstones, pendants, redesign a necklace into a bracelet, add a new clasp, make matching earrings (if shortening existing necklace)). ​Professional pearl re-stringing service prices vary depending on the size of the pearls, length of strand(s), price of the clasp used and whether other types of beads will be added. Here is a guide to how I determine the cost of the restringing/update. Multi-strand pieces are charged per strand. Pearl Deep Cleaning flat rate of £8 per strand. I don't have a retail shop so most restringing and updating work is done by post. Please don't send me your necklace/bracelet until you have e-mailed me*. Once I know what services you require I will send you a quote (cost and time-scale) for the work to be carried out. We can then arrange for you to send me your necklace/bracelet. Once your restring/update is complete I will send you an invoice which can be paid via PayPal. I will then return your necklace/bracelet to you via Royal Mail Special Delivery. Please contact me for postal rates. There are no refunds on pearl/bead restringing or repair. If you are unhappy for any reason please contact me to arrange return of the item to be restrung one time within 2 weeks of receipt. Please contact me to arrange return so that I know to expect your return. Please provide your original Pearl Tree receipt. Unless you tell me otherwise, I may use photos of your item and/or your feedback on my website and other social media pages to show others examples of work that I have done. I do not publicly provide any information about the owner of the item. I use customers' first names and town/country when quoting any feedback. I do not sell or give customer contact information to anyone. Your privacy is important to me. Close up of hand knotted freshwater pearls. Close up of clasp end with French wire/gimp to protect silk thread. ​About Restringing and Updating your Pearls - what you should know. A variety of colours of silk thread are available. When restringing I mostly use the traditional method of hand knotting pearls on strong silk thread. Pearl strands are knotted between each pearl, this ensures that the pearls don't rub together and helps create a beautiful drape. It also prevents pearls being lost if the strand breaks; should the strand break then because each pearl is secured with a knot only one or two pearls will come off the strand. The silk thread is strong but also very delicate on the pearl and won't cut into the nacre of the pearl over time. I mostly use white silk thread but you can choose from a variety of colours. All silk strung pearls and beads eventually weaken and stretch with wear. The silk thread is exposed to body oils, cosmetics as well as abrasion from the holes in the pearls and general wear and tear. Pearl and other bead strands should be restrung whenever the silk becomes frayed, discoloured or if the pearls/beads slide between the knots at all. 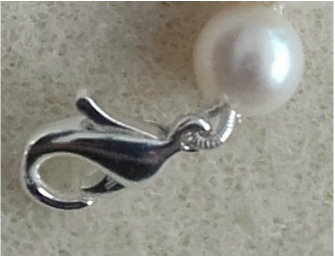 The point of most stress in a necklace or bracelet is between the clasp and the first pearl, where the gimp/French wire is situated. (Gimp/French wire is a metal coil used to protect the silk thread). It's worth keeping an eye out for any sign of discoloration; if the gimp becomes green it is a sure sign that the silk is rotting underneath. In any event, pearl and bead strands should be strung at least once every 1-3 years to avoid the strand breaking and losing pearls. The point of most stress in a necklace or bracelet is between the clasp and the first pearl is situated. I spend extra time covering the silk thread here with the tiniest coiled wire which is called bullion, gimp or French Wire. This protects the silk thread from rubbing against the metal of the clasp and makes the attachment very secure. I also spend a great deal of time weaving the ends of the silk thread back through the holes of the last three pearls on each end of the strand so that it will never unravel or come undone. A word of caution - occasionally I come across pearls that have had glue put on the silk thread at the clasp ends. Unfortunately, this can make these pearls/beads unusable for restringing - especially if super glue has been used and the glue isn't water soluble. Most of the time this isn't obvious until I've started to take the original strand apart and it can be very difficult, if not impossible, to find matching pearls. If this happens I will let you know and discuss with you the options available before continuing. Any pearls I can't restring will be returned to you. In each pearl strand each pearl will vary slightly in size, quality and lustre. Where possible, I will restring the biggest and best quality pearls at the front and centre of the strand and the smallest pearls to the back nearest the clasp. If you have a higher quality strand this will already have been done and I will keep the pearls in the same order. Because the silk thread stretches over time I knot strands a little tightly so that your restrung necklace or bracelet may appear a little kinked at first. With wear, the weight of the pearls/beads and body heat the strand will stretch a little over time. If the pearls aren't strung tightly at first then pearls will slip between the knots very quickly and give an uneven appearance and cause extra wear and tear on the pearls and the silk thread. A little note about the size of knots. The silk thread I use to string pearls and other beads comes in a variety of different sizes. The size used on each strand of pearls or beads is determined by the size of the drill holes in each strand. Very fine silk thread that produces tiny knots will not be suitable for pearls and beads that have fairly large holes because the knots will just slip through the holes. Likewise thicker silk thread may not pass through the hole and even if it does the large knot it produces won't look good. On receipt of your pearl/beads, and before I start any restringing or update work them, I will photograph each item, taking close-ups of the clasp ends and any other important detail and I will send you these photos for your records. I will photograph each piece as I complete it and send these photos to you. These photographs will be useful for you to keep should you need to have your pieces revalued/insured.